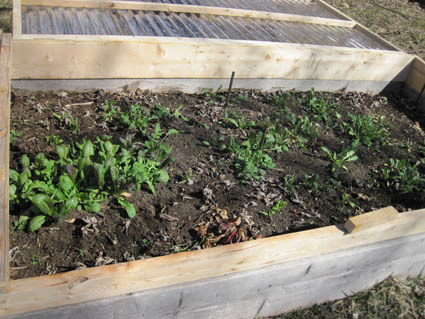 We create and maintain organic vegetable gardens in your backyard or business. Another growing season has come and gone, though I still have kale that’s ready for harvest so I suppose it’s not really over, but it sure feels that way. As usual I’ve learned, observed and made some conclusions I’d like to share with you. I always experiment with some new vegetables and this year was no exception. I actually tried to grow ginger a few years ago and was not successful. I wasn’t terribly surprised as ginger is a truly tropical plant, but I had some ginger in my kitchen this spring that was starting to sprout so I decided to plant it. I grew it in a client’s garden where there was a lot more sun than anywhere in my garden. After about a month in the ground with no sign of it, I’d just about given up on expecting any results when suddenly there were stalks pushing up out of the ground, looking like some sort of grass. I left the plants in until the first frost and then harvested. 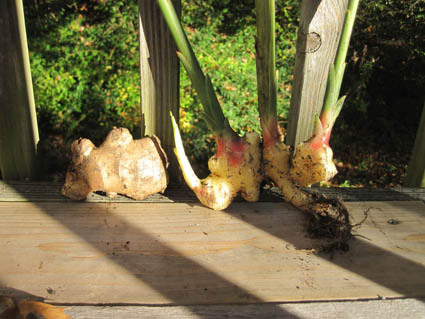 As you can see in the picture below, the ginger just about doubled in size (the original piece of ginger is on the left). 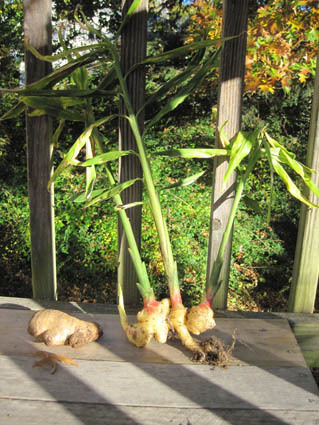 I found it very interesting that the piece of ginger I planted was still intact (unlike seed potatoes which disappear as the potato plant grows) and had not even formed any roots. Also surprising was all of the roots were on the new ginger. Traditionally, we haven’t been able to grow artichokes in this part of the country because our growing season is too short, but plant breeders have developed new varieties which we can grow here so I decided to give it a shot. 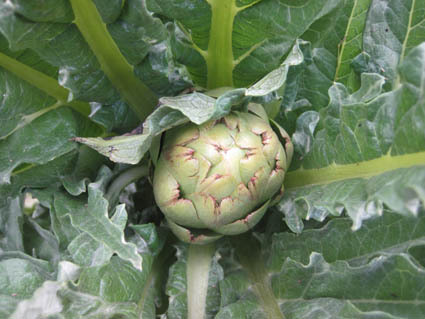 By early September there were still no artichokes developing so I was concerned I wouldn’t get any, especially since frost wasn’t too far away and I’d read that artichokes were fairly sensitive to frost. Suddenly though, one started to form and when ready, my wife said it was delicious (I don’t like artichokes). Eventually I got another 5 artichokes though, like the side heads on a broccoli plants, all were smaller than the first one. 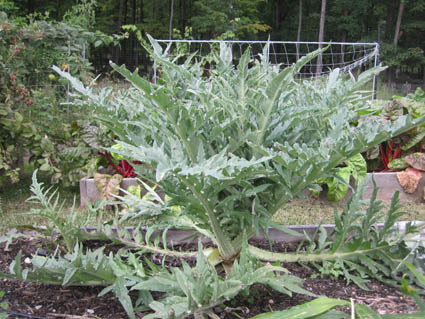 I planted 2 artichokes but only one of them really developed (you can see the small one to the left of the large plant). That’s probably just as well because you can see how large the other plant grew. I planted them 18” apart, but judging from the plant size, I’d say 30” is probably more appropriate. One thing I’ve really come to enjoy is the number of vegetables I don’t have to plant anymore, they do it themselves. Mostly, this is because I let certain plants go to seed (go to seed means forming seeds but the more common term in gardening). Then their seeds drop and new ones come up later in the year (dill, cilantro, and mustard) or the next year (kale , amaranth, and Egyptian Walking onions). This does cause a bit of disorder in the garden, but that just doesn’t bother me. I’ll be back soon with the more unfortunate results of 2013. So as I sit here writing it’s snowing outside. 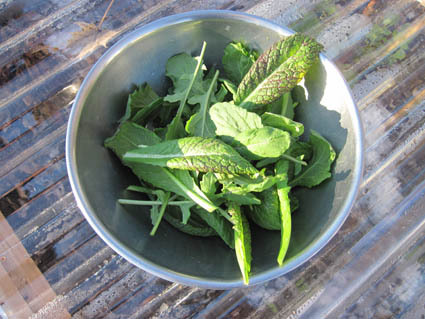 And yet, two days ago I harvested and ate my first salad of the season. I’ve been craving some fresh greens (I’ve been eating my frozen kale all winter long and still have a lot to go) and assumed I’d get some sort of early harvest because of my cold frame. 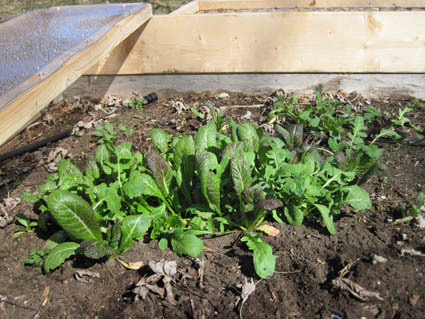 But it was a shock on Monday when I went out to my cold frame to open it up (so the temperature inside didn’t get too high) and saw many of the plants inside (mustard, arugula & lettuce mostly) were suddenly of harvestable size, smallish, but still harvestable. As you can see from the top picture there’s plenty of empty space in the cold frame, so I’m going to throw some addition seed in there this week. More of what’s already there, plus some beets. It would be too early to start any of these without protection, but it’s perfectly fine in a cold frame. If you’re planning on getting your garden going early, you should already be starting seeds either in a cold frame, in a greenhouse, or inside under lights. Seeds you can/should start now include any member of the Onion family, Cabbage family (Cabbage, Broccoli, Cauliflower, Kale, Mustard, Bok Choy), Beets, Arugula, Lettuces, & Spinach. May you grow your own salad as early as you can.